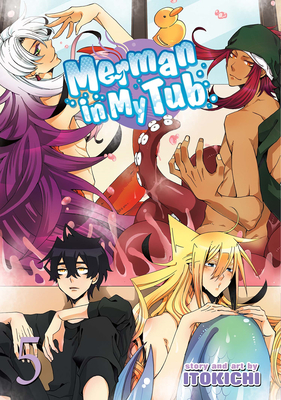 Merman in My Tub is an uproarious supernatural comedy manga that turns the popular "monster girl" genre on its tail with the odd couple relationship between a young man and a merman who has invaded his bathtub. What happens when an intruder from the sea stakes claim to your bathtub? A cool yet demure teenage boy named Tatsumi must learn to live with the self-obsessed and playful merman Wakasa in a small Tokyo apartment. These two dissimilar young men will learn what it takes to deal with one another in their everyday lives. Of course, impromptu visits by Wakasa’s anthropomorphic ocean friends—an octopus, jelly fish, and hermit crab—do not make things easier. Welcome to Tatsumi’s bathtub. It’s getting crowded! Itokichi is a Japanese artist best known for Merman in My Tub.